The Scotland 7s squad which is going to San Francisco. Three players from Melrose, including BT Premiership player of the year, Craig Jackson, are part of Scotland’s 12-man squad for this month’s Rugby World Cup Sevens in San Francisco. 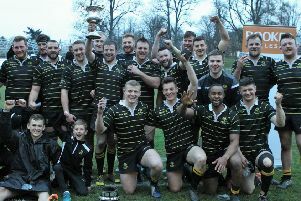 Jackson, already capped by Scotland 7s, also represented Scotland Club XV last season and won the 2011 Melrose 7s alongside now head coach John Dalziel, who also has Melrose connections. Shortly afterwards, Jackson was declared star player for season 2017-18 in the BT Premiership. Sam Pecquer is involved for the first time since the Cape Town World Series tournament, having recovered from a leg injury that kept him out for most of the season, while Greenyards colleague Nyle Godsmark is also in the team. Scott Riddell captains the squad on July 21-22 at what will be his third World Cup and is the only member of the travelling party to have competed previously at one. Six of the 12 were also members of the Team Scotland squad that competed at the Gold Coast Commonwealth Games in April. Scotland hosted the first ever Rugby World Cup Sevens back in 1993 and their best ever finish came in Hong Kong in 2005 when they finished fifth. Their performances and placings up until this season’s Hong Kong tournament secured Scotland qualification and they automatically qualify for the round of 16, where they await the winner of Kenya v Tonga. The new tournament structure is such that every match counts, and Dalziel’s side will need to win their opening match to qualify for the Championship and be in with a chance of lifting the Melrose Cup. Dalziel said: “We’re looking to build on the experiences gained by this group so far this season. “The World Cup is a unique tournament to be involved in, and both preparing for and competing at it will be great development for the young players in our squad. “Craig Jackson has a great rugby brain that he has displayed when he trained with us at various points throughout the season. “He has previous Scotland 7s experience and brings a skill set that compliments our other two half backs. Scotland’s first game kicks off in California at 3.03am UK time on Saturday, July 21, in which they’ll face the winner of the clash between Tonga and Kenya. The squad comprises Scott Riddell (c), Nyle Godsmark, Jo Nayacavou, Jack Cuthbert, Alec Coombes, Robbie Fergusson, Gavin Lowe, Craig Jackson, Harvey Elms, Max McFarland, Jamie Farndale and Sam Pecquer.